Feeling glum? Why you should exercise the blues away. How your brain activity changes when competing with others. Researcher’s have found your brain patterns differ when competing with others compared to competing with yourself. Find out how on Science Daily. How scientists have just discovered the oldest species on earth. Scientists have located a number of underwater organisms up to 200,000 years old. Find out more at the Telegraph. Why NASA can't afford to help Europe go to Mars. Recent news found NASA is on the brink of pulling out of the ExoMars program scheduled for 2016-2018. Find out why at on io9. Don't search for jobs. 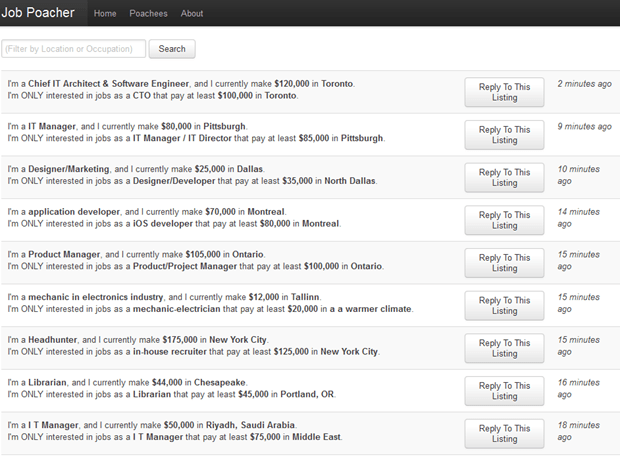 Get yourself poached with JobPoacher. Let’s face it, job sites are numerous. But how many take literally seconds fill in and don’t expose your identity?. Try out JobPoacher. The future of charging your mobile device: With your clothes? Scientists have unraveled a new charging solution that can be woven into clothing. Find out more on TechWeekGroup. End your procrastination with PomodoroPro. Need a way to get motivated and complete those mundane tasks before the deadline? Find out how with the PomodoroPro app for the iPhone. Mind your surroundings while walking and texting with Transparent Screen. Worried about bumping into your environment as you stroll down the street using your Android phone? Find out how you can walk and text with confidence using the Transparent Screen app.